Storage devices and storage technologies have changed our digital lifestyle in unusual ways. Entirely new sources of information such as digital images, sound, and video demand both high capacity and high-performance disk storage. Changing times demanded fast, efficient, and state-of-the-art storage drive interface technologies, and to grow and evolve further, this demand must be met. The storage technology evolution is all about media density versus cost over the small period of time. Parallel SCSI and parallel ATA were developed with having a ten-year scalable performance roadmap. Their roles in IT infrastructure were fundamentally distinct: servers needed the speed and reliability of SCSI storage, while economic ATA storage was adequate for desktop use. As time passed, parallel storage buses became problematic with the increase in demand for faster throughput. This is when serial interfaces came into the picture, became reliable and started to grow. Simpler, faster and more robust, serial architecture was clearly the wave of the future, and serial ATA (SATA) was born. SATA is a technology that came into existence in 2003. It is the short form of Serial Advanced Technology Attachment. It is a single cable with a minimum of four wires. Technically speaking, It is a computer bus interface that connects host bus adapters to storage devices. The SATA interface creates a point-to-point connection between devices. Storage devices such as hard disk drives, optical drives, and solid-state drives can be connected via SATA interface.The major advantage of this technology is that SATA host adapters and devices can communicate via a high-speed serial cable. 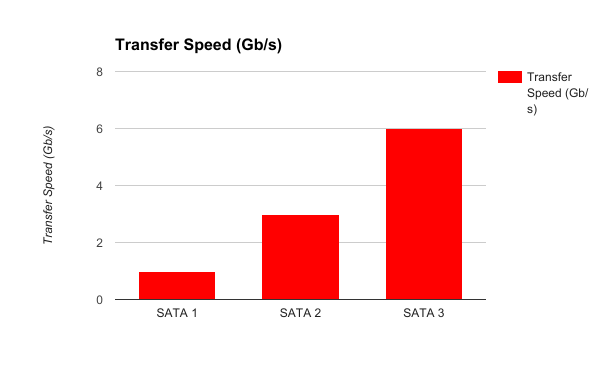 PATA is capable of bandwidth throughput of 66, 100 and 133 MBs/second, whereas SATA is capable of 150, 300 and 600 MBs/ second for SATA 1, 2, th 3 respectively. The SATA cable is comparatively long as compared to the PATA cable. The SATA cable is up to 1 meter long and provides more flexibility when it comes to mounting a hard-disk inside a CPU. As the width SATA cable is less as compared to the older PATA cable, your computer can live a little longer owing to increased airflow. The SATA connections on the motherboard allow 4 to 6 connection points allowing connectivity for more hard drives. There are only two such PATA connections on a motherboard. You can easily take advantage of the data destruction service to make sure you completely remove any form of data or its footprings on SATA drives. SATA 2 is known as SATA 3Gb/s. It is the second generation SATA interface running at 3.0 Gb/s. The interface supports bandwidth throughput up to 300MB/s. SATA III is known as SATA 6Gb/s. 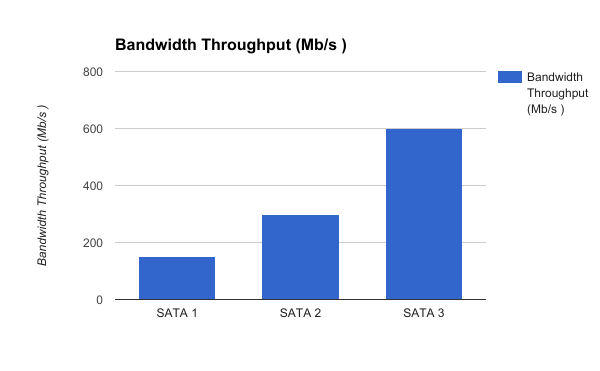 It is a third-generation SATA interface running at 6.0Gb/s.Th interface supports bandwidth throughput up to 600MB/s. This interface is compatible backward with SATA 3 Gb/s interface. mSATA is the short form for Mini SATA and can be looked at as a smaller version of SATA. It is different from the micro connector, was announced by the Serial ATA International Organization on September 21, 2009. For devices requiring a smaller solid state, mSATA is a viable option. Smaller devices like Netbooks and Laptops made use of this available option. The mSATA connector shows a lot of similarities, compatibility wise to the PCI Express Mini Card interface. The mSATA standard uses the PCI Express Mini Card physical card layout and connectors and supports data transfer rates ranging from 1.5 Gb/s to 3.0 Gb/s. It provides high performance and enables compact integration. Manufacturers, including Toshiba, Samsung, HP, Intel, SanDisk, and Dell use mSATA drives are today. m.2 pronounced as M dot two is more fondly known as Next Generation Form Factor. It is a specification for internally mounted computer expansion cards and connectors. This technology replaces the mSATA standard, which uses the PCI Express Mini Card physical card layout and connectors. It provides more flexibility allowing different module widths and lengths, and, paired with the availability of more advanced interfacing features. This is what makes the M.2 more suitable than mSATA for solid-state storage drives which can be used in small devices such as slim and thin ultrabooks or tablets. Computer bus interfaces provided through the M.2 connector are PCI Express 3.0, Serial ATA 3.0, and USB 3.0. PCI stands for Peripheral Component Interconnect. The ‘e’ means express, regarding express speed. It is a high-speed serial computer expansion bus standard. 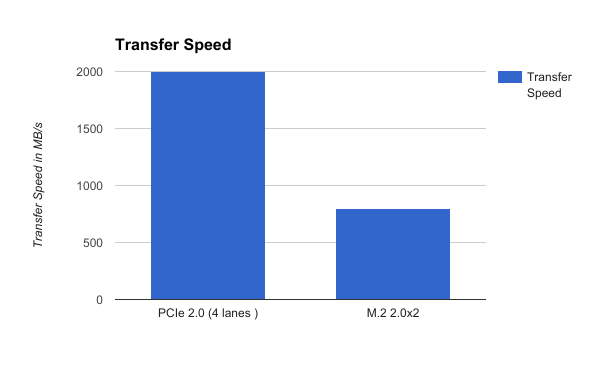 And as we said ‘express’ speed it is designed to replace its predecessors PCI, PCI-X, and AGP bus standards. There are 3 types PCI slots. First the traditional Mini PCI slot, the full height Mini PCIe slot and the half-height Mini PCIe slot. The Mini PCI cards are 59.6 × 50.95 mm, the full height Mini PCIe cards are 30×50.95 mm, and half-height Mini PCIe cards are 30×26.8 mm. Mini PCI Express is the smaller version of the PCI Express peripheral interface which is used for laptops, computers and other portable devices. Mini Express Cards use the PCI Express signalling interface and can be plugged directly into the motherboard. Many of the compact personal computing devices where space is limited use the Mini PCIe slot. When comparing the mSATA, M.2 and PCI Express Mini we need to get one thing clear and straight they are not the same. They are not computer interfaces they simply are form factors, by which we mean the size and type of the connector pins. mSATA and M.2 which replaced it later uses the SATA II/III interfaces. On the other hand, Express Mini isa little different. It is a kind on its own and uses the M.2 form factor. M.2 it is just a form factor with a new size and connector type and it does not give you better performance. If you want performance, just make sure you have a drive with the faster interface. To boost or to get the kind of performance, the SATA-III or PCI Express (3rd Gen) would be a good option.